A mix of Malaysian and Chinese-influenced dishes populates the menu at this food truck in South Lake Union. It’s not uncommon to hear of food trucks that blossom into brick-and-mortar restaurants. It’s less common to hear of the opposite: restaurants that branch out into food trucks. But that’s just the story behind Malaysian food truck Seattle Mamak. The orders got so large and frequent that he started thinking: Wouldn’t it be more time- and cost-efficient to run a restaurant business right in South Lake Union? And hence, Yoo, who was born and raised in Malaysia, opened Malaysian food truck Seattle Mamak about two-and-a-half years ago. Its mobile nature solved the issue of delivery costs without the property-rental costs that come with opening a brick-and-mortar restaurant. 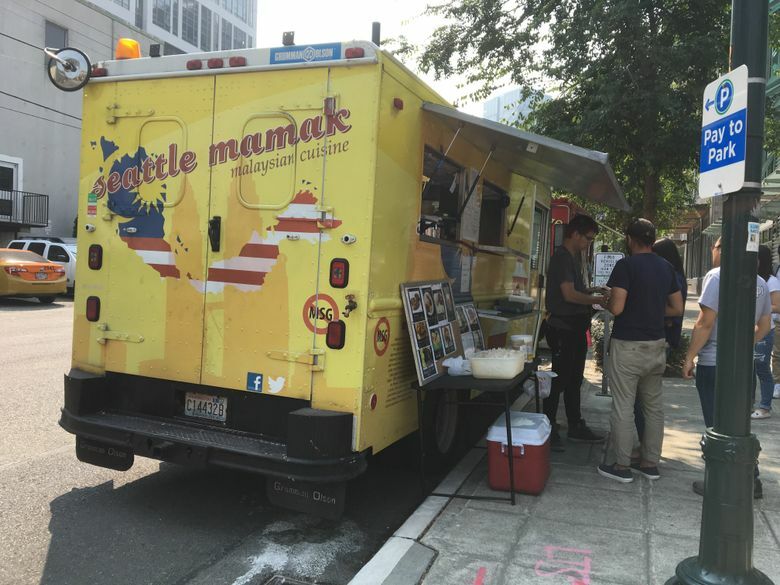 Now, Seattle Mamak’s bright-yellow truck is parked every weekday at lunch hour on the corner of Terry Avenue North and Thomas Street — one of the few spots to find Malaysian cuisine around Seattle. The menu: Seattle Mamak provides some solid traditional Malaysian dishes — nasi lemak, roti canai and Hainanese chicken rice. Yoo says they are all common in Malaysia. Most of the other dishes are Chinese-influenced, however, catering to the truck’s large Chinese customer base. (Yoo says about 85 percent of Seattle Mamak’s clientele is Chinese.) However, Malaysian cuisine itself draws from a mix of influences, Yoo says, including Chinese, Indian and Malay. 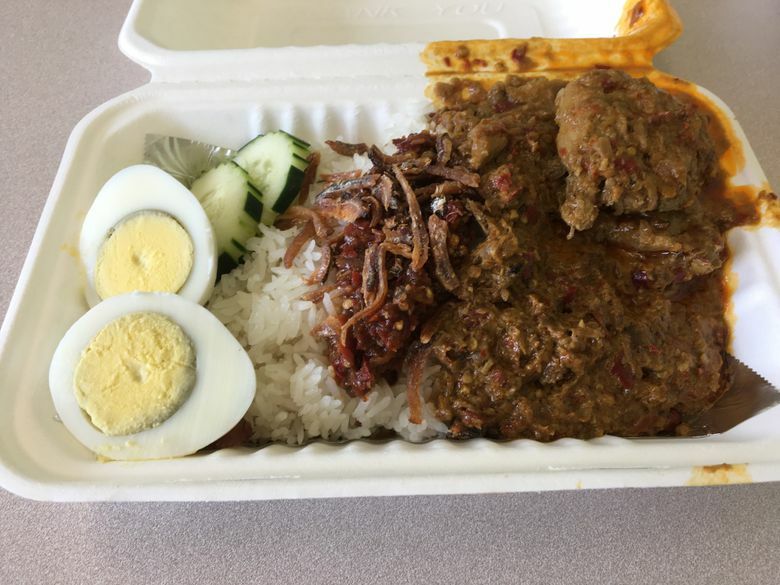 Don’t miss: Nasi lemak, Yoo’s personal favorite — especially if you’re unfamiliar with Malaysian cuisine. The dish, containing a scoop of rice with curry chicken, anchovies, a hard-boiled egg, fresh cucumber slices and sambal — a kind of chili sauce made with shrimp paste — is a mix of bold flavors and textures that come together quite nicely. The sambal added a kick, but wasn’t overpowering, speaking as someone who can barely tolerate Sriracha. Ask for it on the side, even if you’re spicy-averse; it’s ubiquitous in Malaysian and Indonesian cuisine, and worth a taste. The chicken was pleasantly tender. Overall, the serving size was generous enough to save some for the next day’s lunch, if you so desire. 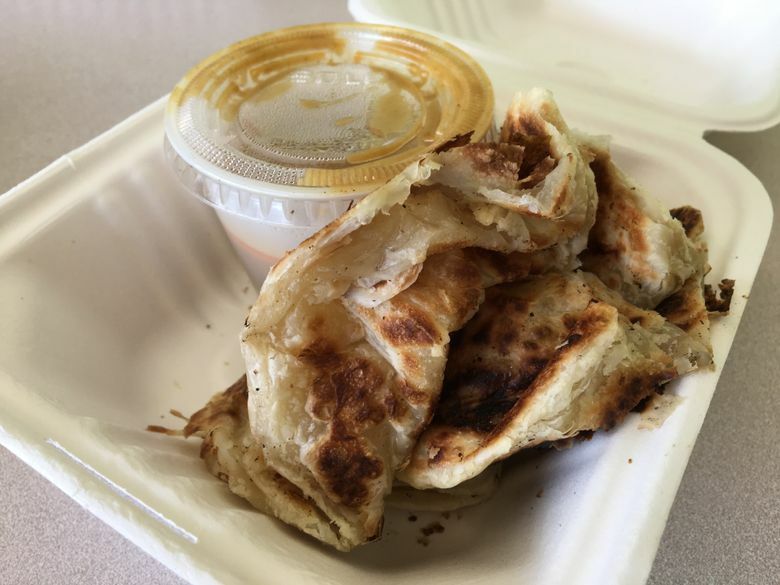 Do also get an order of roti canai, a fried bread that looks sort of like a cross between naan and Chinese scallion pancakes (minus the scallions). The roti is crispy on the outside, soft and buttery on the inside, with a tad bit of sweetness. It comes with a potato curry sauce for dipping, but it hardly needs an accompaniment (though the sauce was good as well). The roti came out so warm and deliciously fragrant, it was a test of willpower to trudge back to the office without stealing a bite. What to skip: If you want to truly experience Malaysian cuisine, skip the soy sauce pork with noodle or any other nontraditional Malaysian dish on the menu. 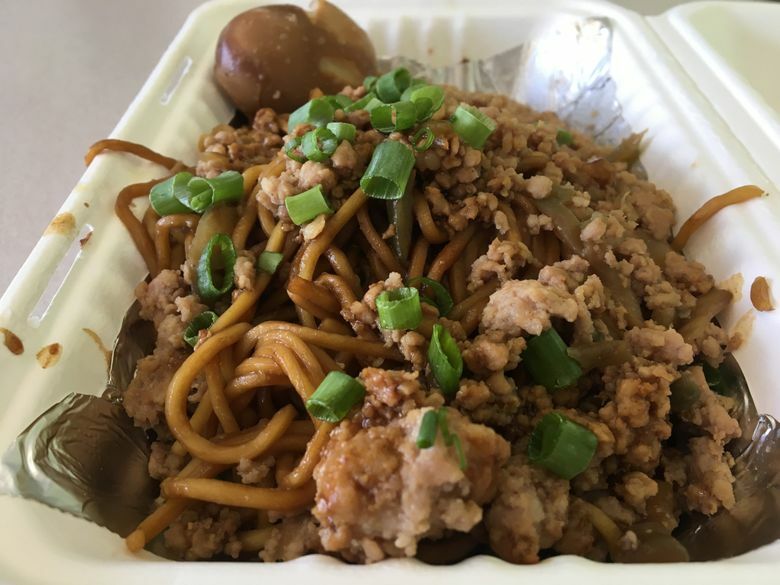 The noodle dish — containing ground pork, bean sprouts, scallions and a boiled egg on the side — was similar to noodle dishes you might find elsewhere at Chinese restaurants, like dan dan noodles, but without the numbing spice. That said, the dish was quite delicious. If you just want a solid noodle dish for lunch, don’t let me stop you. Prices: Nasi lemak (listed as $12, tax included), soy sauce pork with noodle ($11) and roti canai ($4) amounted to $27 before tip. This was more than enough food for two.